This page contains short summaries of the main writing projects I’ve been involved in since I first got started writing teaching materials for publication in the early 1990s. This is the first book I was involved in. (There’s also an intermediate version but I could n’t find a copy of the cover!). I co-wrote it with a close friend and colleague in L’Aquila, Abruzzo, Italy. Tania and I were inspired by the fact that our bosses at The English School of L’Aquila were published authors, so we reckoned we could be too. Our initial title was possibly slightly more inspired (It Takes Two) – but we loved the working title on the first proofs – Talking in Paris. It was written back in the days before email and the pages were literally cut and pasted together with scissors and glue, with an extra ten days factored in to each deadline to allow for snail mail between Italy and the UK. Almost ten years later we were working on our first project for Macmillan, thanks to a fortuitous meeting with a great ELT figure and editor, David Riley. What started out as a sample for a pre-intermediate coursebook for OUP turned into ten resources book activities for the new Inside Out series. 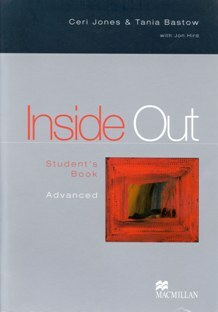 Two years later we were working on our first coursebook – Inside Out Advanced – bouncing emails and attachments back and forth from Hungary and then Spain to Italy and the UK . The first edition came out in 2000 and the new edition almost ten years later in 2009. Both times the project was a real challenge and a great pleasure, not least because of the co-writing element, and the ups and downs involved in writing at a distance. Shortly after finishing Inside Out Advanced I was approached to write a sample for an elementary coursebook for Richmond Santillana. The switch from Advanced to Elementary was a big jump, but a great new direction to take, not least because it meant working alongside Ben Goldstein for the first time. The course had various “teething” problems, but in many ways was ahead of its times and has done particularly well in Latin America. Click here if you’d like to know more about the course. When I was on maternity leave in 2002 I was lucky to get involved in a new Macmillan coursebook project being headed by Philip Kerr. I started out as a reviewer for the first level, pre-intermediate, and was very impressed by the thorough, efficient, creative and totally professional approach. 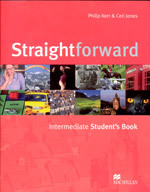 A few months later I was asked to join the writing team as co-author first on the Intermediate student book and later on the Upper Intermediate student book and workbook. It was an amazing experience and a true education in how to approach coursebook writing. Click here to find out more about Straightforward. In March 2007 I led a workshop at the TESOL Spain conference in San Sebastian on the use of literature in the classroom. It so happened that later the same day I was talking to an editor who was interested in launching a new series of readers for Macmillan. The basic idea was to use authentic short stories, both classical and modern, to bridge the gap between graded readers and extended authentic texts. The results was the Macmillan Literature Collections. A series of short story collections on various themes which offer L2 readers a “safe route” from the support and structure of a graded text to the autonomy of reading and enjoying L2 literature. So far I have been involved in writing accompanying material for four collections, Horror Stories, Science-fiction Stories, Crime Stories and 20th Century Stories – and have acted as editor for a further three collections: Mystery Stories, Adventure Stories and Food Stories (coming out this spring). They have all been great fun to work on and I hope to be involved in more collections in the future. Click here if you want to know more about the series. 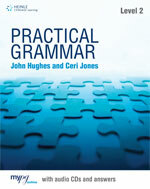 In 2007 I was approached by Cengage (formerly Heinle ELT) to review a new grammar course that had been designed, and was at the time being co-written, by my first ELT materials writing mentor, David Riley. It was thanks to David that I first became involved in coursebook writing. I had always valued and respected his judgement and I was honoured to be asked to review his materials. Sadly, David died of cancer in the autumn of the same year and was unable to complete the writing of the three levels of the course. It was with mixed feelings of sadness and pride that I accepted the invitation to co-write the remaining two books with John Hughes. It was a daunting task at times, not least trying to keep faithful to David’s vision, but one that stimulated and challenged me for two years. In 2008 I was again invited to join Ben Goldstein on a new adult coursebook project . Whereas on the Framework series we had worked on different levels, this time we worked together as a writing team. It has been an incredibly stimulating experience. The Big Picture, as the title suggests, places a heavy emphasis on the use of images: real world images; images that engage, empower and stimulate; images that activate language and encourage exploration. And it was great fun – and sometimes a sizeable challenge – to find and source the kind of images we wanted to use. I really like the inside out books! Thank you! It’s been a great experience working on the series with Sue and Vaughan.